Welcome to May and a brand new season of Talk Amongst Yourselves. You can talk about video games all you'd like, but please also admire our new artwork. This month's painting is Marriage à-la-mode: 2. 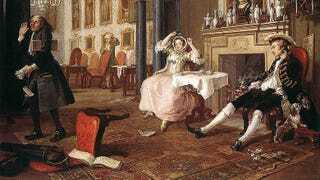 The Tête à Tête by William Hogarth. Thanks to reader Mythos for the suggestion. Now, as we do every month, you're invited to photoshop this image to make a joke of some sort about video games. If you do, your work could be featured atop a future TAY post. Submit your image to #TAYpics.